This video is based on a Southend Times eight page pictorial supplement dated 30th August 1923. Its title was “Homemaking at Benfleet and Canvey” and tells the story of a young couple called Jim and Madge visiting Benfleet to make a decision about moving there. The video uses the pictures from the supplement along with some other pictures from the 1920’s. The spoken text is from the supplement with some minor changes. The video was originally shown at the Benfleet Community Archive 3rd Annual Show in the “Benfleet Kinema” room on Saturday 9th March 2013. 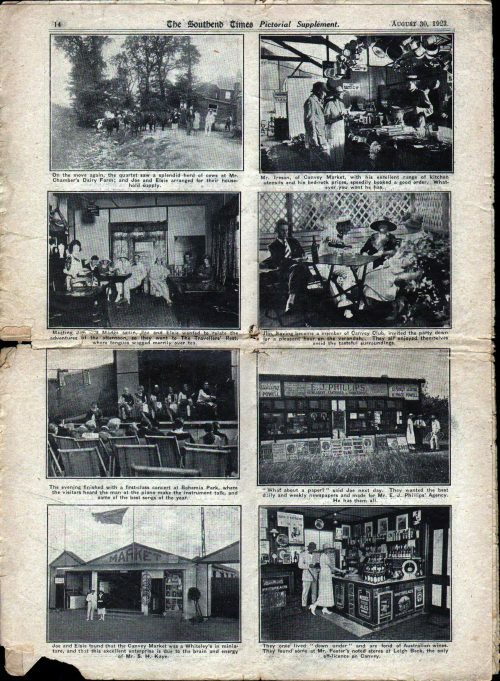 The pictures in the supplement are shown below and also contain the second part when Madge’s cousin Elsie with her husband Joe are shown around Canvey Island. Our thanks to Doreen Brazier, who has looked after this supplement all these years, for lending it to us. Pt1: Jim and Madge arrive at Benfleet. Pt 2: Jim and Madge explore Benfleet. 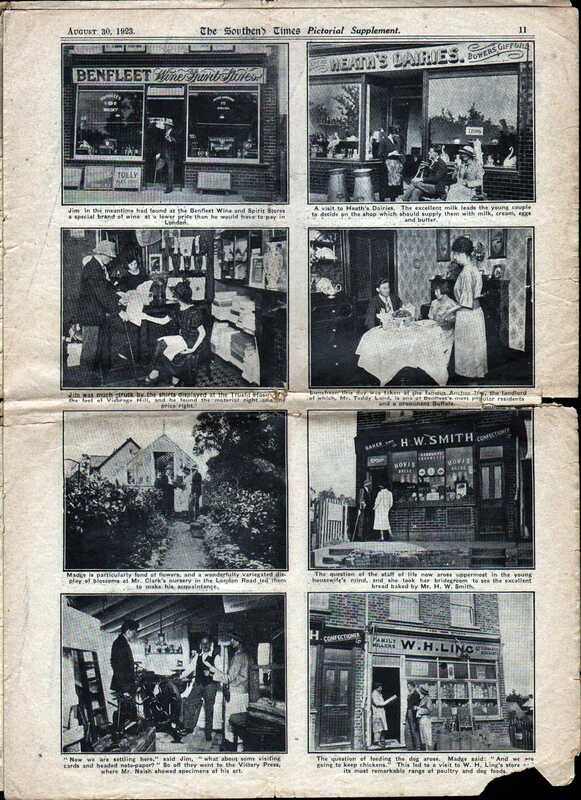 Pt 3: Jim and Madge visit Benfleet shops. 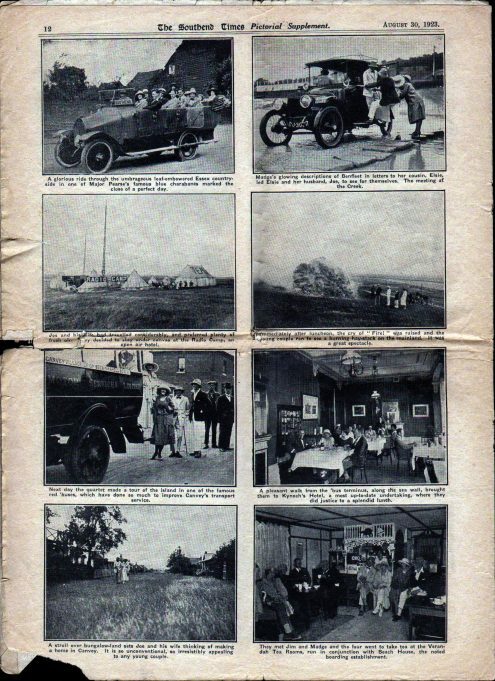 Pt 4: Elsie and Joe visit Canvey Island. 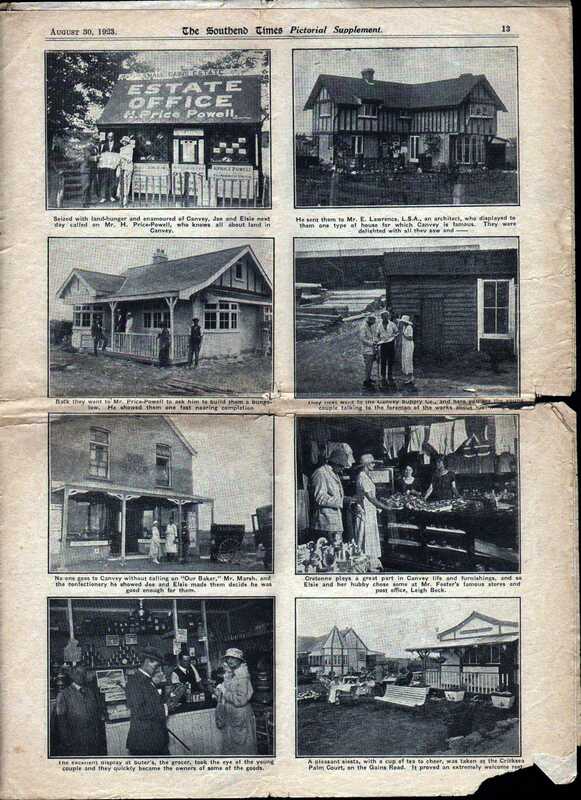 Pt 5: Elsie and Joe look for property on Canvey Island. 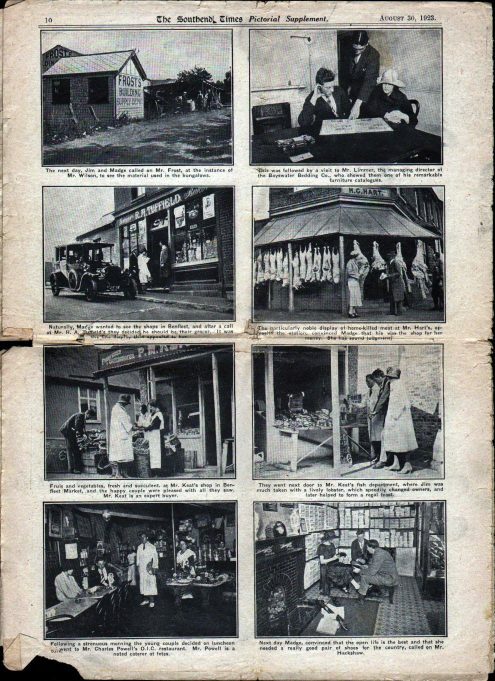 Pt 6: Elsie and Joe visit some Canvey businesses. Pt 7: Elsie and Joe being entertained on Canvey. 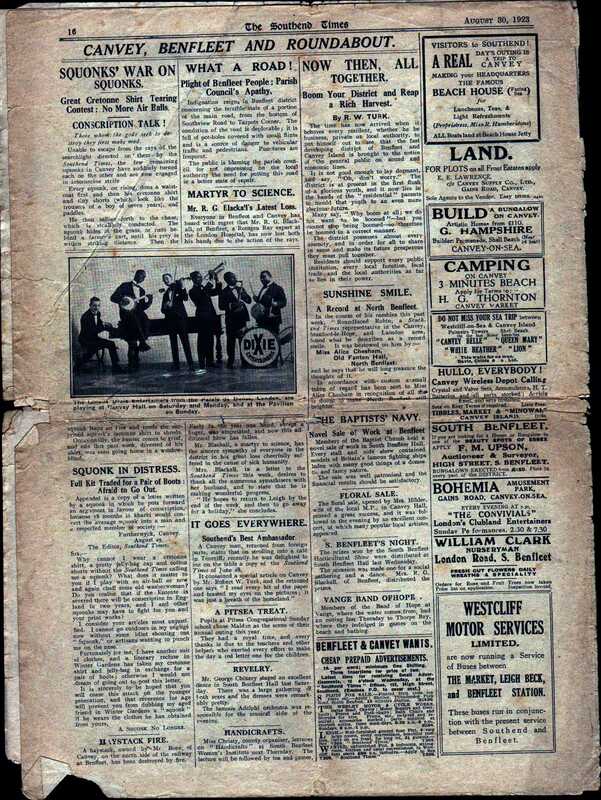 Pt 8: Back page of supplement showing some local news. Sorry, probably totally irrelevant, but the name Doreen Brazier seems very familiar to me! I was born in 1947 and I haven’t actually lived in Benfleet since age 17. My Aunts Lily, May, Ivy and Uncle Leon Hubbard, all worked at Hobsons, both in the old and new factories on the corner of Kiln Road and somehow this comes to mind when I recall the name. Perhaps I am wrong and it was a name from King John School, but still familiar. I don’t know what a “squonk” is in the context of Canvey. However reading the two articles suggests that it is a fashion statement by teenagers for wearing on the beach. Part of the costume is a cretonne shirt. 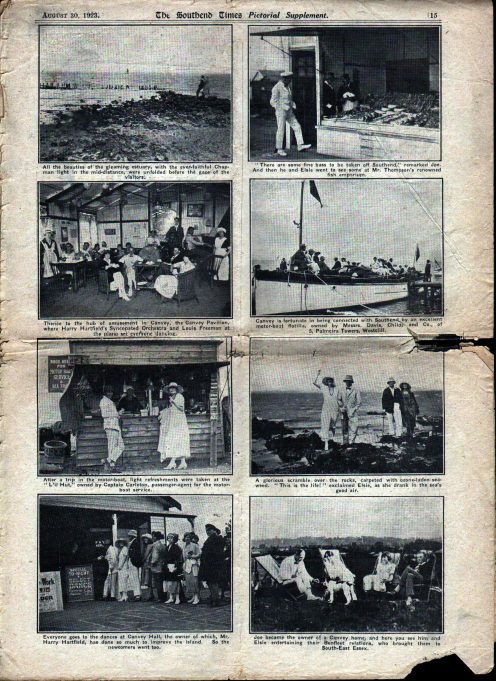 Searching the web shows a cretonne shirt in this Getty image and this one both dated August 1922 for Canvey Island. I will be doing further research at the Newspaper Library and will keep this on the research topics. What is, or was a ‘squonk’ ? My mother was two years old then and still lives in the Benfleet area, maiden name Barbara Champion. 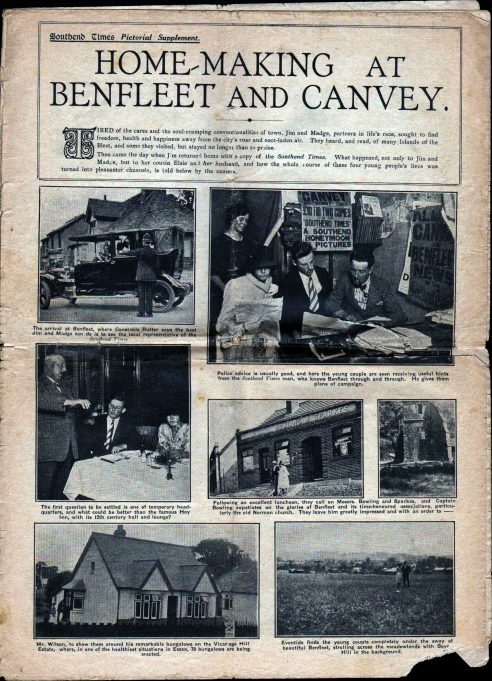 Great and interesting photos and video of old Benfleet, the year I was born.